Mercedes-Benz E-Class Cabriolet Performance, Engine, Ride, Handling | What Car? There are four engine options so far, all turbocharged: two 2.0-litre four-cylinders, a 191bhp diesel and a 242bhp petrol, badged E220 d and E300 respectively; and two 3.0-litre V6s, a 254bhp diesel (we have yet to drive this model) and a 328bhp petrol, known in turn as the E350 d and E400. The two latter engines come as standard with four-wheel drive. While the E400 is the most potent of the lot, it isn’t an engine that will slap you in the face with its performance. Instead, it delivers its big hit of power and torque in a more subtle and less overt manner, picking up its skirts and heading for the horizon with very little fuss. And yet, the lesser E300, which has to make do with two fewer cylinders, doesn’t feel a whole lot slower than the range topper. Mash your right foot into the carpet and the E300 completes the run from 0-62mph in just 6.4sec, and with Sport Plus mode selected, throttle response is sharp, gearshifts are slick and you’re even treated to the odd artificial parp when changing up. Where the E300 lets itself down, however, is on refinement. At lower speeds, it can be hard to ignore the engine’s rather gruff four-cylinder thrum. It also lacks the low-down shove of the entry-level E220 d – an engine that is expected to be the best-seller of the range. Granted, with only 192bhp, you could argue that the E220 d looks a bit underpowered on paper. However, the relaxed pace of the diesel engine feels suitable in a top-down cruiser – this is not a car to be driven aggressively. 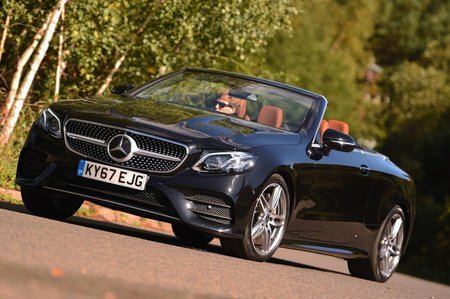 Roll on performance is also surprisingly impressive and will prove perfectly adequate for most E-Class Cabriolet buyers. Whichever model you choose, there’s a spot of engine noise when you push the E-Class Cabriolet hard, but it’s kept reasonably under control. And the same applies wind and road noise; with the top down, the standard wind deflector system means buffeting is kept to a minimum, and even on the motorway it’s quiet enough to have a conversation with your passenger. Raise the roof – it takes 20 seconds and can be operated at anywhere up to 31mph – and the sense of quietness and isolation is even more impressive. There are two types of suspension available: a standard steel-sprung system, which we haven’t had the chance to drive yet, and the optional air suspension system – not cheap, but worth the extra cost because it gives the E-Class a beautifully floaty ride that’s only ever troubled by the roughest of road surfaces, even when fitted with large wheels. One of the advantages of this system is that you can stiffen up the suspension and adjust the steering, throttle and gearbox response at the touch of a button. You get to choose between four pre-set modes, but can also mix and match settings with an Individual mode. However, even in Sport Plus mode – with the car at its stiffest and sharpest – the E-Class feels quite big and heavy, and a little uncomfortable if you try pushing it hard through a set of challenging bends. At the limit, its tendency is to push its nose wide gently and safely, and while it always feels stable and grippy, the numb steering means there’s little enjoyment to be had. 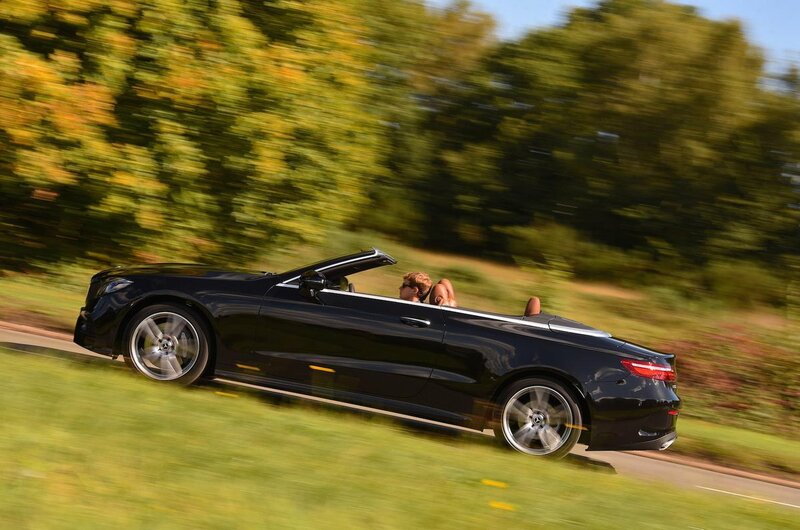 It’s better, in fact, to leave the E-Class Cabriolet in Comfort mode. This means you get even more body lean, but the flip side is that the suspension soaks up bumps and allows you to lope along in a more relaxed manner. In the E400, of course, you get lots more traction thanks to the four-wheel drive-system, although the extra weight of this means the model feels a little less light on its feet than the smaller-engined cars.